Every family has their dining traditions and at my in-laws there are no exceptions; whether its New Year’s, Easter or birthday dinners, we always have this dish on the menu. My mother in law has mastered the art in making this “iconic” Americanized sushi, which my father in law lovingly refers to as “Not Real Sushi”. Finally as promised, I’m posting her recipe and pictures (with her demonstrating the process)…Nothing tastes better than Mom’s food, prepared with love and care…Enjoy (OO). Ingredients: (Yields 6 cups) 3 “rice cooker” cups of uncooked premium sushi or short grain rice, water, 1/3 cup (measuring cup) Japanese rice vinegar, 1 teaspoon of salt, 3 Tablespoon of sugar, Imitation crab meat (200 g, purchased from Japanese food store), 3-4 avocado (ripen, sliced), Japanese “kewpie” mayonnaise, 1/2 to 1 cup (approximately) toasted white sesame (prepackaged can be purchased at Asian food store), six to eight full sheets of seaweed (nori), juice of 1/2 lemon, pickled ginger (for serving only, store-bought), soy sauce and wasabi (optional) for serving. – Put rice in large glass or stainless steel mixing bowl (I preferred to use the Japanese rice washing bowl with side and bottom drainers), pour water over until fully covers rice. Discard the water immediately to get rid of the particles, repeat 1 to 2 times. – Using your fingers wash and clean the rice in circular motion; pour clean water over the rice and quickly discard again. Please repeat the process for 4 to 5 times until water becomes almost clear (translucent). – Let the rice soak in clean water for at least 30 minutes; drain and strain the rice then transfer to rice cooker bowl. – Add cold water to just under the 3 cup line; if your rice cooker has “sushi rice” options, please follow and add water just below the 3 cup line “sushi rice”, start cooking. 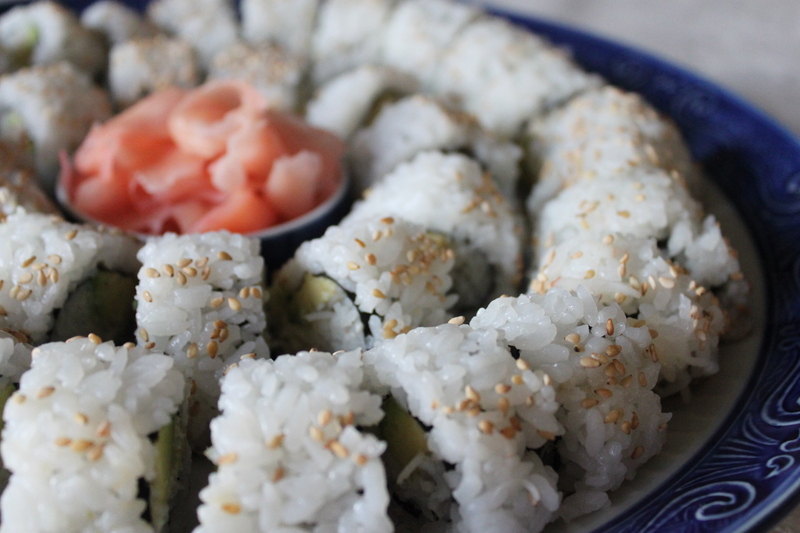 – While rice is cooking, prepare the sushi vinegar: combine rice vinegar, sugar, salt into a saucepan. Over medium heat, bring it to a boil until sugar is completely dissolved; remove from heat, set aside and let it cool. 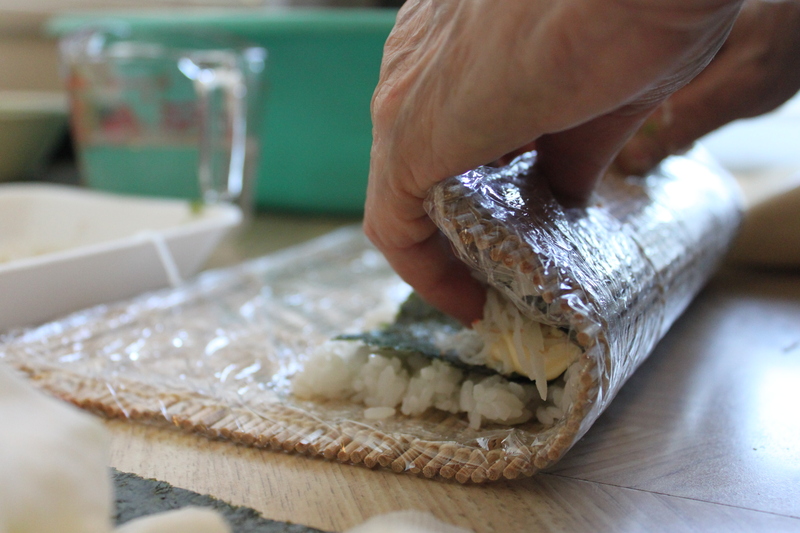 – When rice is cooked, using a moistened (with little water to ensure rice doesn’t stick) large bowl (sushi wooden bowl if you have one), transfer the rice and spread it out evenly so the rice will cool faster. 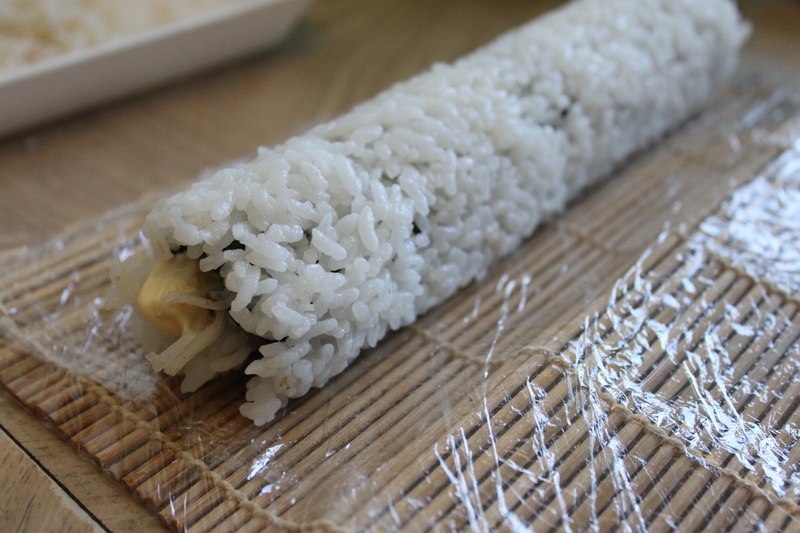 While rice is still hot, pour approximately 85% of the sushi vinegar mixture over the rice; leave some behind as you will need this when rolling the sushi. – Using a wet rice paddle (at 45 degrees angle) and apply the “slicing and flipping” motion, separate the grains (do not mix), gently flip the rice in between “slices”; repeat the process until the rice is cooled. 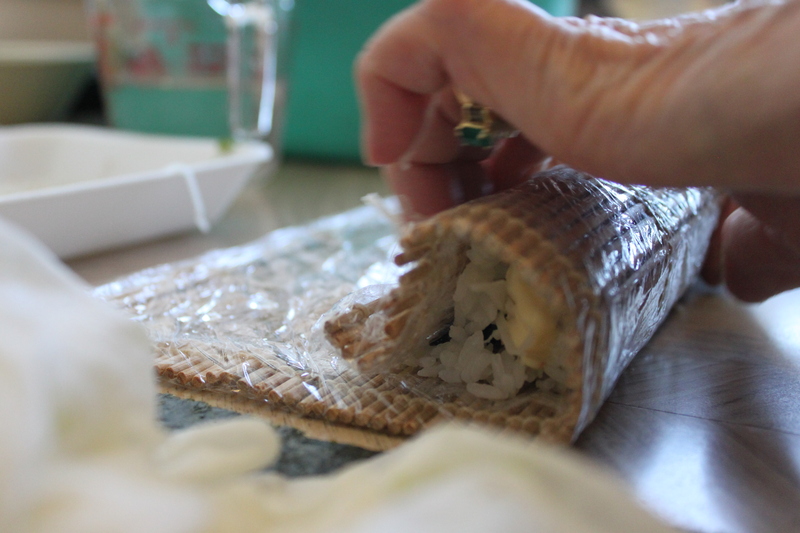 – Cover the cooled rice with a damp cloth until you are ready to roll. – Prepare the avocado; peel and cut into 1/4″ slices, a squeeze of lemon juice will keep the avocados from turning brown. 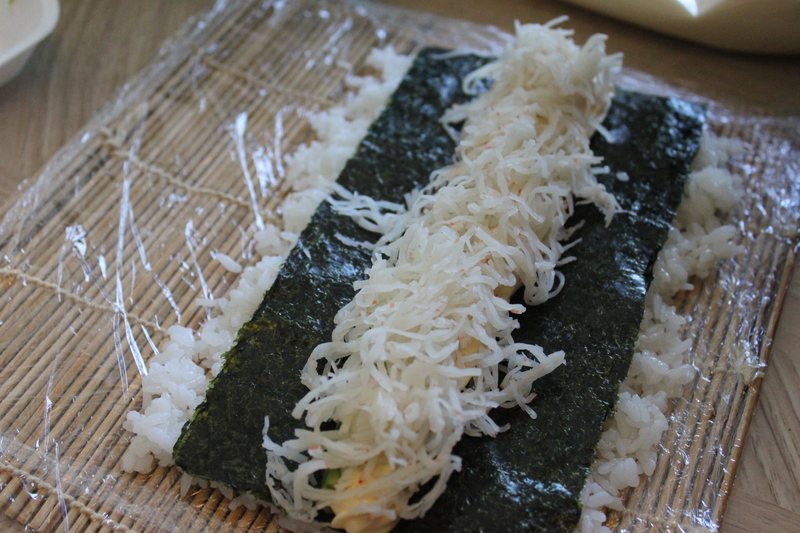 – Prepare the seaweed (nori) – Cut off 1/3 and use 2/3 to make the rolls (save the one thirds for later use). 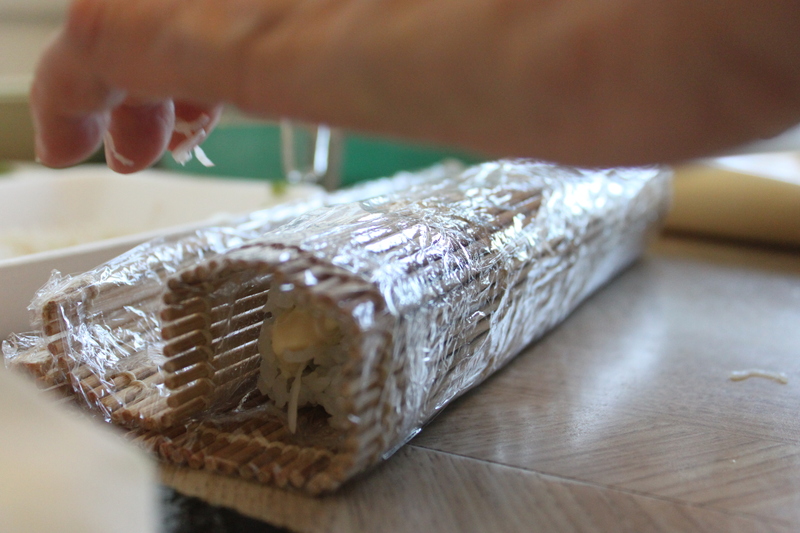 – Prepare the bamboo mat, covered with plastic wrap and the sushi vinegar (to ensure the rice will not stick to the wrap). – Lay one seaweed sheet, shiny side down, on the mat. 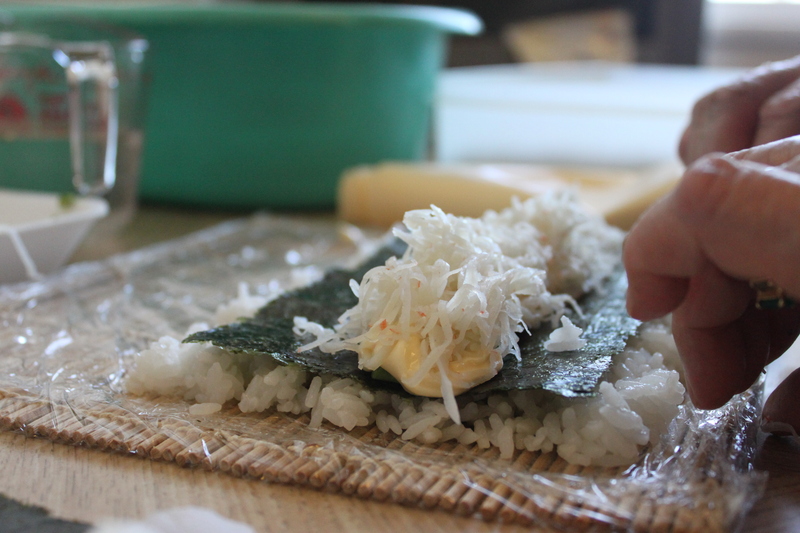 Wet your fingers in the sushi vinegar and spread approximately 1 cup or less (measuring cup) of rice thinly and evenly onto the seaweed sheet. 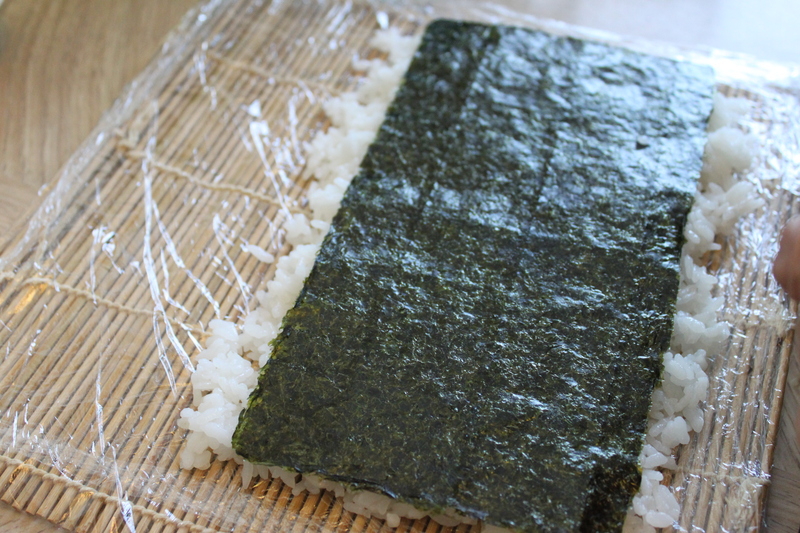 – Flip the seaweed sheet over so the rice is facing down; then line the edge of the seaweed sheet at the bottom of the bamboo mat. – Using the mat to shape the cylinder. Lift the edge of the mat slightly and roll it forward, apply pressure gently. Another roll completed! How many more to go? – Repeat until all the rice is used up. 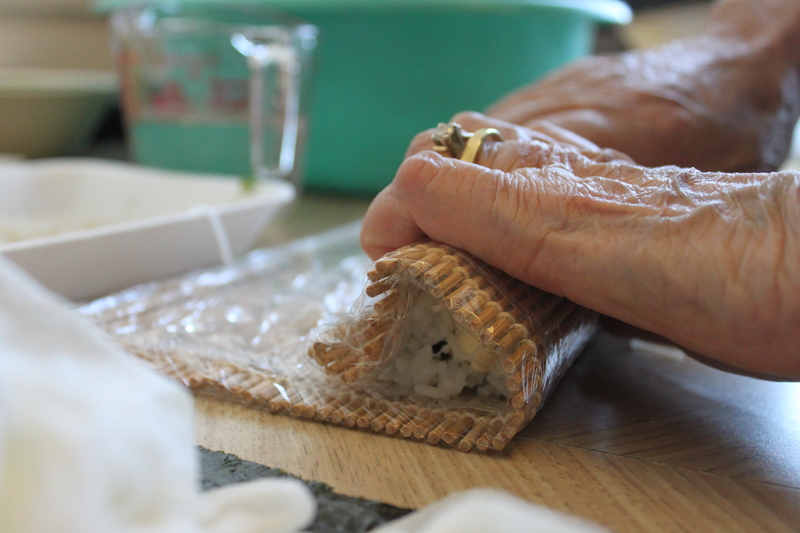 – Cover the bottom of a rectangular container or tray with the white sesame, glide the sushi roll over until it’s even covered. – Cover the completed rolls with a clean damp cloth until you are ready to serve. – When you are ready to serve: Use a sharp knife and cut each roll first in half, then cut each half into 3 pieces. After a few cuts, remember to clean the knife with a damp cloth (to keep the rice from sticking and maintain a clean finish). 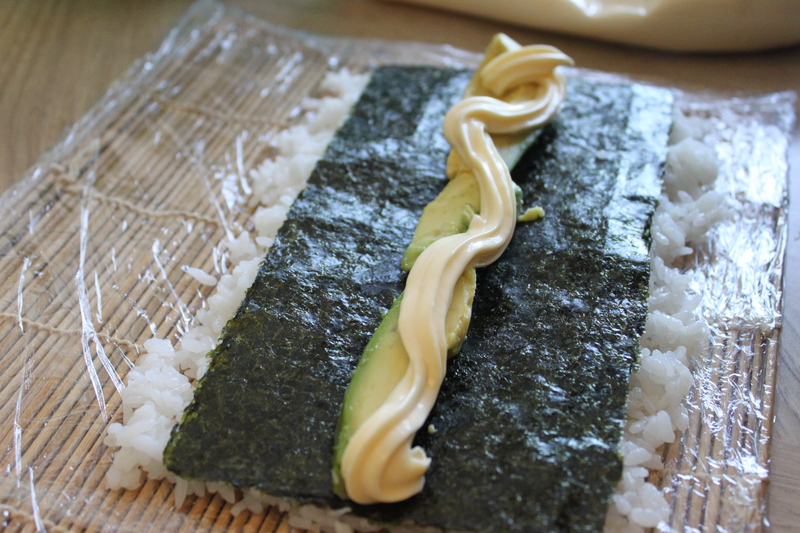 – We always use the cut seaweed sheets for smaller roll sushi, mostly tuna or cucumber rolls. 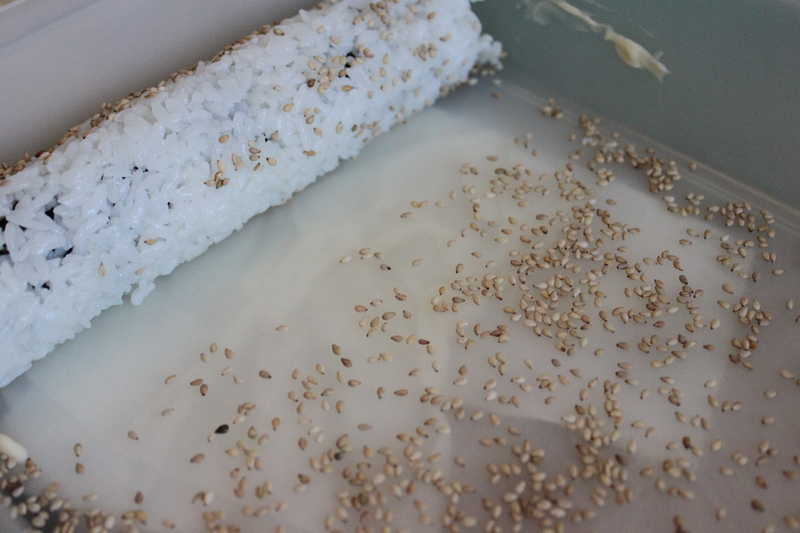 – Some of the ingredients we estimated the quantity (for example the sesame seeds), please adjust accordingly. – Fresh crab meat can be used; my mother in law usually purchases the imitation crab meat, and other ingredients from Fujiya (912 Clark Drive, Vancouver, BC). – Other recipes include cucumber; sometimes we use flying fish roe (tobiko) instead of toasted white sesame seeds, or both (OO). could you post the name of the Japanese store in Richmond that you bought the sausage, thank you. Hi Cecilia, thank you very much for tuning in and dropping by to visit my blog. The name of the Japanese store is Nikuya Meats, 11220 Voyageur Way in Richmond. I will be posting the information shortly.